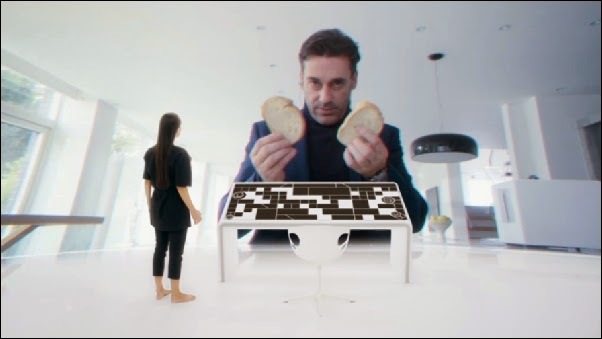 Speaking of digital entities, Channel 4 last night screened the latest episode of Charlie Brooker's 'Black Mirror', an anthology of dark dramas which Brooker has described as having the purpose of "actively unsettling people" about the future. "White Christmas" weaves together three separate tales of near-future technology, tying them up brilliantly at the end through the use of brain scanning as a plot device. Brain scanning is the central theme running through my novel Beside an Open Window, and it was fascinating to see the thought given to the consequences of this idea by Brooker - which include using a digital scan of your brain to organise your life, the use of an avatar body in virtual settings for scans, the incarceration of scans and speeding up time for scans so that they experience enormous stretches of time in just a few seconds. There are plenty more ideas explored besides, perhaps most notably the concept of blocking/muting someone in real life. It was one of the best written and certainly the most imaginative pieces of TV I've seen all year. If you live in the UK, you have a month to watch it on demand here. If you're elsewhere, watch out for this on your networks.